Since all my recent movie reviews have been turning this blog into a poor man's version of the IMDb, I thought I'd break things up a bit with an occasional series of music videos. Having been given a shoutout on JJAMZ official Facebook page after mentioning their "Heartbeat" video, it has inspired me to write about other bands who I've discovered during my various internet surfing sprees. I've only just heard about "Blood on the Dance Floor". I'm not sure what to make of them yet, but I thought their latest song was appropriate for the Hallowe'en season - plus, of course, the band name has "blood" in it. Maybe the video doesn't really count as horror even though the lead singer, Dahvie Vanity, is quite horrible to look at unless you are into "scene" or "emos" or whatever the hell they are, but I kind of like the song. It's nothing amazing musically, but it's okay for a pop song, and not what I was expecting the band to sound like. 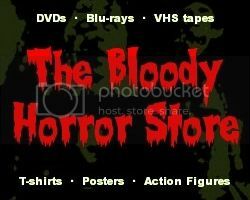 At least it's not some nasty heavy metal crap which every other stereotypical horror fan seems to be into. Apparently, "Blood on the Dance Floor" have attracted a lot of online hate due to various allegations against Dahvie Vanity, but I couldn't really care less about any of that drama. As far as I can tell, there isn't any truth to any of the rumours, and most of the insults flying around seem to be fuelled by jealousy. "You're attractive, little witch, you're beautiful." I don't know who Lady Nogrady is other than being the pretty girl in the video, but some people say that she was in a movie called "Poe". I can't find any further details about it, although I assume that it was about Edgar Allan Poe. That's good enough for me. Part of me thinks that "Blood on the Dance Floor" are some kind of joke act rather a bunch of serious musicians, but the same was said of "Aqua" and look how well they did.